If last week’s The Walking Dead midseason premiere was a warm-up episode, this week’s Home episode was a homerun. 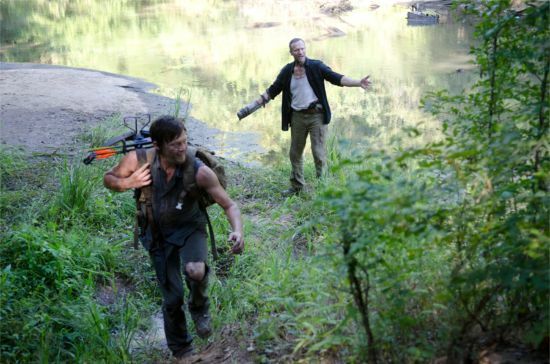 Things that occurred last week such as Daryl leaving Rick’s group with Merle set up an exciting last minute rescue scene this week. With the Governor attacking and the prison in disarray, there are a lot of questions for Walking Dead fans to ponder until the next episode. Where Is Tyreese? – The biggest mystery of the “Home” episode is exactly where Tyreese and his group were while the attack on the prison was occurring. In the midseason premier, Tyreese and his group were ushered away when Rick started going crazy. In this week’s episode, Tryreese’s group isn’t mentioned at all. Did they leave the prison after Rick went crazy or are they still locked up somewhere in the prison? Will Merle Be Accepted Into Rick’s Group? – After Merle and Daryl show up to save Rick from certain death, will Rick’s attitude about Merle change? With Merle having essentially tried to kill both Michonne and Glenn, can he ever be truly accepted into Rick’s group? Since Daryl is unlikely to part with his brother Merle, it’s going to be a tough decision for the group over if their fondness for Daryl is enough to help them overcome their hatred of Merle. Will Andrea Lead Woodbury? – The Governor appears to be setting up Andrea as the new leader of Woodbury. Andrea knows there are good people in Woodbury, so it wouldn’t be surprising if she accepted the role to help keep the people of Woodbury safe. But would the Governor ever really turn over power to Andrea. Based on his action, it appears that he wants Andrea to be leader in name only, while he still pulls the strings and carries out his own plans. Will The Second Baby Return? – As Comicbook.com correctly predicted, one of the babies shown in the season three previews was not baby Judith but was actually a second baby. While the group of the survivors with the new baby went along their way in this episode, will they return in a future episode? Could they join up with Rick’s group at the prison, giving some company to baby Judith? Will Rick’s Group Leave The Prison? – Speaking of the prison, will Rick’s group even stay at the prison? With the Governor having shown that he knows their location and is willing to attack, will Rick and his group be forced to relocate? Instead of trying to once again clear the zombies from inside, Rick and his group might decide it makes more sense to just pack up their supplies and look for a new location.